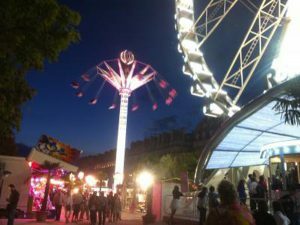 Another summertime treat in Paris is the annual La Fete Foraine du Jardin des Tuileries (typically just called the Fete des Tuileries), a temporary funfair set up in the Jardin des Tuileries adjacent to the Louvre. Held this year from June 28 to August 24, the festival includes more than 60 “fair-type” rides, attractions and food vendors. 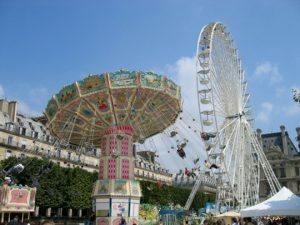 Among the rides are a merry-go-round, bumper cars, a small rollercoaster, ghost train (what Americans would call a haunted house), a swing carousel, the “zipper” and the enormous La Grande Roue—a huge Ferris wheel that provides stunning views of the city. A number of free musical performances also are scheduled throughout the fair, including an upcoming swing and jazz festival on Aug. 14-15. And it wouldn’t be a funfair without carnival-type foods. Kids will delight in such sweet treats as cotton candy (called barbe a papa—which means “old man’s beard”—in French), crepes, waffles (gaufres), churros, beignets, homemade marshmallows (guimauves), caramel apples (pomme d’amour) and much more. Of course, the Tuileries many promenades, elegant statuary and fountains, and meticulously landscaped grounds are—as always—available for relaxation and rejuvenation. 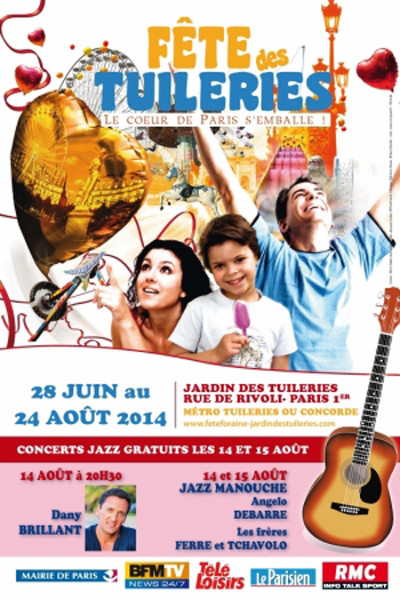 The Fete des Tuileries can be reached via the Concorde and Tuileries Metro stations. Admission to the fair is free, but rides and carnival games typically cost from €2 to €3. Food and drinks also are available for purchase. The Fete des Tuileries is open from 11 a.m.-11:45 p.m. Sunday-Thursday, and 11 a.m.-12:45 a.m. Friday and Saturday. 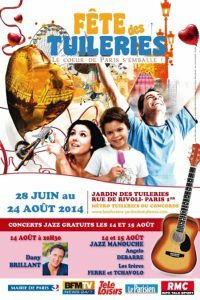 This entry was posted in Entertainment, Famous Paris destinations, French culture, Parks and Squares, Right Bank, Summer in Paris and tagged Fete des Tuileries, La Fete Foraine du Jardin des Tuileries by Bob Adams. Bookmark the permalink.